Who is the audience for this book? Most people buy it to keep it on their coffeetable to start conversations -- the typical voter would not read it through. Most political analysts know everything that's in here already -- there are no daring new policies nor deep personal revelations. I've concluded that the intended audience is the excerpter -- people like me. This book got excerpted in Time magazine, for example, and Obama got a big cover spread, with a presidential headline. The Time excerpts were pleasant to read -- a little uplift for a few pages. But the book is just so chock-full of respectfulness and understanding and consensus-building and bipartisanship that no excerpter can find anything BUT uplift in any excerpt (including me). So my conclusion is that the book is INTENDED for that purpose -- a successful attempt to get Obama into the national spotlight by writing a political tome that everyone will like and few will actually read through. This book contains nothing but numerous uplifting anecdotes of building consensus based on understanding one's opponents' point of view, of bipartisanship based on mutual respect. Reading an excerpt or two fills one with an uplifting feeling. Reading the original in its entirety, however, feels like slogging through uplifting anecdote after uplifting anecdote, to the point where it feels formulaically forced. The formula goes like this for every issue: "The proponents believe X. The opponents believe Y. I tend to lean toward the proponents' views, but I have great respect for the opponents, and we should work together on consensus solutions." I imagine that Obama met with his ghostwriter and outlined his issue stances, then told the ghostwriter to frame each one in a context of that sort of bipartisan respect. Overall, of course, this is exactly the sort of book needed for the presidential trail. Having the book on coffeetables across America, despite being unread, means Barack's smiling face is in people's living rooms and he's in people's conversations. Having uplifting anecdotes excerpted in Time and OnTheIssues means people will read about their favorite topic, be uplifted, and repeat the anecdote to their fellow voters. It doesn't matter that the SAME formula is used for EVERY issue -- people aren't interested in EVERY issue, just their favorite ones. But if you want to get to know Obama, read instead Dreams From My Father, which is indeed a revealing biography and a deep look at his compelling personal story. This book is written instead for the campaign trail. 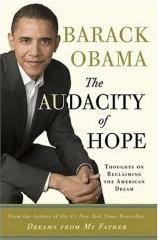 I do have a fantasy about how Obama came up with the title (because people like Obama hire people like me to come up with titles like "The Audacity of Hope"). I imagine that Obama wants to elicit a subconscious connection with Howard Dean -- who is characterized by his audacious campaign style -- and simultaneously elicit a subconscious connection with Bill Clinton -- whose book titles often include his hometown of Hope, Arkansas, as in Between Hope and History. Obama's title hence attempts to elicit a subconscious feeling that "Obama has the audacity of Dean, but with Clinton's chances of success." Maybe I'm reading too much subconsciousness into it -- but it's people like me who write these titles, so who knows. Indeed my title theory was a fantasy -- the title came from a sermon given by the now-famous Rev. Jeremiah Wright. Barack Obama: Constitution is a living document; no strict constructionism. Barack Obama: Extend presumption of good faith to abortion protesters. Stephen Breyer: Apply context & history to original Constitution. Barack Obama: Return to PayGo: compensate for all new spending. Bill Clinton: Ran budget by "PayGo": compensate for any lost revenue. Barack Obama: Opposes gay marriage; supports civil union & gay equality. Barack Obama: No black or white America--just United States of America. New Testament: OpEd: Apply Sermon on the Mount to gays, not Romans. Barack Obama: Videotape all capital punishment interrogations. Barack Obama: Some heinous crimes justify the ultimate punishment. Barack Obama: Deal with street-level drug dealing as minimum-wage affair. Barack Obama: Public school system status quo is indefensible. Barack Obama: More teacher pay in exchange for more teacher accountability. Barack Obama: We cannot drill our way out of our addiction to oil. Barack Obama: Listening to evangelicals bridges major political fault line. Barack Obama: Filibuster has long tradition, but used to harm civil rights. Barack Obama: Lobbyist influence comes from access, not money. Barack Obama: Keep guns out of inner cities--but also problem of morality. Barack Obama: Healthcare system is broken without lifetime employment. Barack Obama: The market alone can�t solve our health-care woes. Barack Obama: Battling terrorism must go beyond belligerence vs. isolation. Barack Obama: Grow size of military to maintain rotation schedules. Barack Obama: Owes unions who endorsed him; that�s why he�s in politics. Barack Obama: Working full-time should mean enough to support a family. Barack Obama: �Audacity of Hope� to change politics to reflect common good. Barack Obama: Post-1960s politics more about moral attitude than issues. Barack Obama: Americans dislike partisanship--not solution like Dems think. Barack Obama: Raised secular, but with working knowledge of world religion. Barack Obama: Baptized as an adult in the Trinity United Church of Christ. Barack Obama: Progressives should recognize common morality with religion. Barack Obama: Religious concerns ok, if translated into universal values. Bill Clinton: Obama: Clinton pushed progressive despite partisan Congress. Republican Party: Obama: GOP wins elections by vilifying Democrats. Barack Obama: Stock market risk is ok, but not for Social Security. George W. Bush: OpEd: In aggregate, stock market ok; but what about losers? Barack Obama: Estate tax only affects the wealthiest 1/2 of 1%. Barack Obama: $42B more in university-based R&D. Barack Obama: We are playing to Osama�s plan for winning a war from a cave. Barack Obama: Black churches minister to social needs out of necessity. Thoughts on Reclaiming the American Dream, by Barack Obama.